From school students bullied great and terrible twelve times in English, which should be taught, otherwise you will not know English. Strictly speaking, since the only three in the English as well as in Russian: Present (Present), past (Past) and the future (Future). But every time there is a dimension! And there are four aspects of time: Simple, Continuous, Perfect and Perfect Continuous. And by multiplying turns twelve times. Not only is some rules that must memorize independently. All times are interrelated and logical. The main thing — to understand what he is talking about every aspect + know when there Past, comes Present, Future action will occur, of which you speak = you end up with the right timing in the English language. Aspect Simple, usually talks about the normal activities that occur regularly or continuously. In most cases, if you are not sure what aspect choose select Simple, and can not go wrong! 🙂 Continuous — this action, extended in time, it must continue in any way. Perfect — a result of the action. For many it is difficult Perfect, because we in Russian there is nothing like it. Absolutely not? And if you see two of the verb «to do» and «done»? Which of them will show «the action ended, the result?» Did! So it turns out that most aspect Perfect in Russian — is the verb of the act. We have a Perfect, and it is wonderful! Perfect Continuous — when there is a long-term effect and the result of this action. Imagine that two aspects, Continuous and Perfect, connected, turned Perfect Continuous. In theory, everything is not so difficult. I always thought that everything is logical that all times are shown in the time line. That timeline — how we imagine the movement of time: yesterday, today and tomorrow. On the timeline we have depicted aspect times Simple. Take the example of go to school — to go to school. Complicate the picture and add a dimension Continuous — a sprawling, long-term effect. Now add the third dimension of time Perfect. And finally, the turn to the aspect of Perfect Continuous. As you can see, there is a logic in British times. The main thing — to sit and try to understand this logic. This explanation does not apply to any special occurrences of times, but it will help you build up an overall picture of what may be going on with the action (verb) in English. Interesting observation. Recently I was looking through another series of your favorite TV series «The Big Bang Theory» («The Big Bang Theory»). The 5 Series 8 season stumbled upon an amazing dialogue between the protagonists. Let me remind you briefly: the heroes of the series — a group of physicists, who often find themselves in absurd situations because of its absolute unfitness to real life. These inquisitive minds live in a world of theories, formulas and calculations. In one series, they reflect on the creation of a time machine. Joking aside, I was struck by the grammatical aspect of this invention. 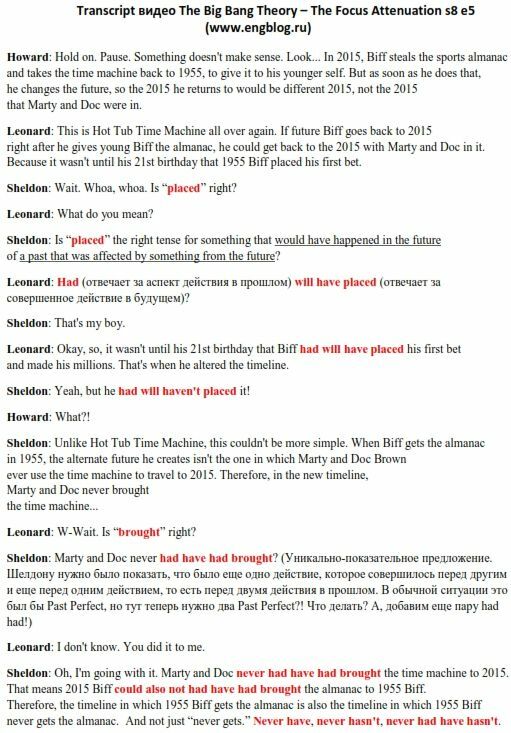 Let us together with Howard, Leonard and Sheldon’s think about how a violation of the passage of time can affect the English grammar. Be sure to check out the video after the spoiler, there is little explanations that will help better understand the flow of American speech heroes. Do not be surprised if you do not understand the first time. I myself was sitting with his mouth open for a while, nervously clutching the air! After 4-5 display pauses and comforting cookies with cocoa decided yet to figure out what was wrong. And the thing is that for the British times — it’s not just old convention. It is a necessity! They simply can not understand in a different way when the action is. After a series of English, I was looking forward to the translation into Russian. At that moment I was not jealous of translators, knowing that only the magic will help to translate all this into Russian. Let’s transfer? Now I’m going to (the word «now» indicates that the action takes place at the moment). — I am going (am going shows that the action is happening at the moment). I usually go («normally» shows us the repeatability of action). — I usually go (yes, added usually, but it will go on repeatability), and so on. D.
If you need more help in working on some aspects of grammar, you can always sign up for the course «Intensive Grammar», which together with the teacher will understand in detail the most complicated rules.